Growing up on 90 acres of farmland in Pavilion NY, Jay Brooks has always had the landscape as an integral part of his life and art. 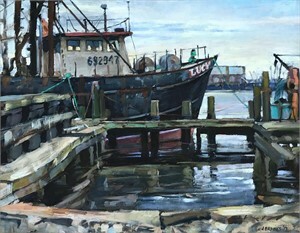 At the young age of 14, Brooks began painting under the classical apprenticeship of John Piesley and the plain – aire instruction of Charles Movalli, a disciple of the late Emile Gruppe. Brooks was also introduced to the pre-impressionist styles of Corot, George Inness and Asher B. Durand. In 1988, Brooks received his B.F.A. from Carnegie–Mellon University and in 1990 he received his M.F.A. from Columbia University. Being removed from his familiar bucolic surroundings, Brooks stud- ied and painted the industrial environments of Pittsburgh and New York City. After teaching art in New York City, Brooks moved back to upstate NY in 1993. Here, Brooks is surrounded by countless varieties of scenes from around the northeastern US. His paintings include a variety of images from depictions of the New England shore to the countryside and small towns of upstate New York. Jay Brooks is currently showing at the River Gallery in Narrowsburg, NY, and the Maresella Gallery in Skaneateles, NY. Brooks has also show regularly in the Chelsea area of New York City, Lambertville NJ, Cody Wyoming, Rochester NY, and Sullivan County NY. In 2001, Brooks entered the Arts for the Parks competition in Jackson Hole, Wyoming and had four paintings in the top 100. Although Brooks main interest in the landscape resides primarily in the scenery of upstate NY, he has also painted scenes in the American West, Puerto Rico, the Austrian and German Alps, Northern Italy, Ireland and the out–back and rain forests of Australia. Brooks also has a great interest in portraiture, military/historical scenes, and railroad scenes. Teaching art has also been a big part of Brooks' life. He has been an art instructor at the high school in Monticello, NY for the last 20 years. Brooks would like to pass the torch of art to his students so they can keep the tradition of painting and drawing alive. Brooks' work is also displayed in many corporate and national collections including Donaldson, Lufkin and Jenrette, McKinsey and Company, US Dept of State, Hallmark Cards, PP&G, Pen Med, The Equitable Corporation, Pfizer and other private collections. Brooks was also published in the February 2004 issue of American Artist Magazine. Jay Brooks Growing up on 90 acres of farmland in Pavilion NY, Jay Brooks has always had the landscape as an integral part of his life and art. 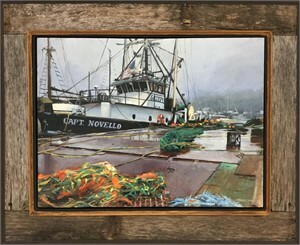 At the young age of 14, Brooks began painting under the classical apprenticeship of John Piesley and the plain – aire instruction of Charles Movalli, a disciple of the late Emile Gruppe. Brooks was also introduced to the pre-impressionist styles of Corot, George Inness and Asher B. Durand. In 1988, Brooks received his B.F.A. from Carnegie–Mellon University and in 1990 he received his M.F.A. from Columbia University. Being removed from his familiar bucolic surroundings, Brooks stud- ied and painted the industrial environments of Pittsburgh and New York City. After teaching art in New York City, Brooks moved back to upstate NY in 1993. Here, Brooks is surrounded by countless varieties of scenes from around the northeastern US. His paintings include a variety of images from depictions of the New England shore to the countryside and small towns of upstate New York. Jay Brooks is currently showing at the River Gallery in Narrowsburg, NY, and the Maresella Gallery in Skaneateles, NY. Brooks has also show regularly in the Chelsea area of New York City, Lambertville NJ, Cody Wyoming, Rochester NY, and Sullivan County NY. In 2001, Brooks entered the Arts for the Parks competition in Jackson Hole, Wyoming and had four paintings in the top 100. Although Brooks main interest in the landscape resides primarily in the scenery of upstate NY, he has also painted scenes in the American West, Puerto Rico, the Austrian and German Alps, Northern Italy, Ireland and the out–back and rain forests of Australia. Brooks also has a great interest in portraiture, military/historical scenes, and railroad scenes. Teaching art has also been a big part of Brooks' life. He has been an art instructor at the high school in Monticello, NY for the last 20 years. Brooks would like to pass the torch of art to his students so they can keep the tradition of painting and drawing alive. Brooks' work is also displayed in many corporate and national collections including Donaldson, Lufkin and Jenrette, McKinsey and Company, US Dept of State, Hallmark Cards, PP&G, Pen Med, The Equitable Corporation, Pfizer and other private collections. Brooks was also published in the February 2004 issue of American Artist Magazine.